There no shortage of choices if you’re looking for brunch in Leeds, but if you’re indecisive (like me) so many options can just make it harder to choose. So where can you find the best brunches? These are my five favourite places in city centre to get a brunch that sets me up for the weekend. Ox Club pops up in almost all my Leeds restaurant posts and yes, I may have a slight obsession, but it’s not misplaced. What I love about its brunch is that you get the feeling of an upscale breakfast without the price tag – dishes and drinks for two can easily come in at under £20. My old favourites were the avocado on toast and honeycomb pancakes, but I urgently need to go back as they’ve refreshed the menu with some drool-worthy new additions, not to mention a different pancake special every weekend. By all appearances The Greedy Pig is the ultimate no-frills greasy spoon…but with much better food. The owners focus on using the best locally-sourced seasonal ingredients, which they show off most on their ever-changing Swine That Dines evening menu, but they first gained fame as the lead provider of fry-ups in Leeds, and have since expanded their breakfast menu to include homemade Merguez sausage, pancakes with fried chicken, and their own recipe black pudding. What Hepworth’s Deli lacks in space it more than makes up for in character – this gorgeous little cafe in Thornton’s Arcade is one of my favourite havens for generous breakfast helpings with friendly staff and great tea. They serve up huge cooked breakfasts (both meat and veggie) and have a wide range of egg dishes, but personally I’m a huge fan of the caramelised apple & cinnamon pancakes, and their killer bacon sandwich. They also offer hash browns as a side dish, which is just the dream. 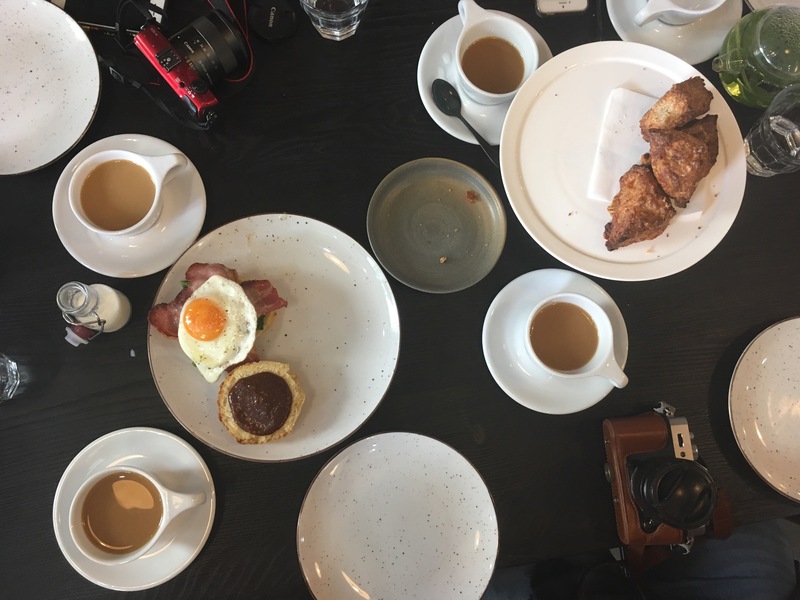 I recently got invited to North Star’s new cafe venture to try out their brunch menu, and I can honestly say it’s a great new addition to Leeds Dock. The brunch dishes – which include granola, cherry and ricotta on brioche, and bacon with homemade ketchup on buttermilk biscuit – are original, the coffee is good, and there’s a droolworthy selection of cakes behind the counter. North Star is definitely the new best reason to trek over to Leeds Dock. Ham & Friends feels like the classier, more refined older sister of Friends of Ham, and it’s definitely the poshest brunch on this list. The beautiful glass ceiling-ed venue helps, as do the immaculate decor and Instagrammable table settings, but there’s also a sense of fine dining about the dishes. On my first visit I chose the chorizo hash, and it was clear how much thought had gone into crafting the dish – the flavours were expertly balanced and everything was cooked to perfection. Definitely a brunch spot for when you’re aiming to impress. Where are your favourite brunch spots in Leeds? What do you think of my list? Tell me in the comments! All good suggestions! I had brunch at Laynes Espresso for the first time the other week and it was amaaazing. Will definitely be going back there. Great list! I’ve only tried Hepworth and North Star out if this list, but I’m dyyyying to try out Ox Club as I keep hearing so many good things about it. Pancake specials sound amazing!